As Fishline celebrates it’s 50th birthday, making it the 2nd oldest food bank in the nation, Tom “pop’s the hood” for us to show what powers that machine. The food bank serves 1,000,000 pounds of food per year from various sources. Grocery rescue, food drives, locally grown, as well as purchased foods all play a pivotal role.. They are a “market style” food bank that uses a point system called “fish bucks”. The market sees over 32,000 family visits per year and is staffed with over 160 volunteer shifts per week. What happens to the spoilage, you may ask. Well, food that is not worth to be “sold” in the market is set aside and donated to local pig farmers who then supply the bacon. Fishline also operated 2 thrift stores in Poulsbo called Second Season. These businesses generate nearly $400,000 in earned income. The 6.5 paid staff members, 3 contractors, and 250 plus volunteers (who teamed up to donate 36,000 hours in 2016, are the gasoline that make the motor go. Tom explains that they are much more than a food bank. They are a resource and they are a partner. They are proud of their “Food for Thought” program, Birthday Fairy, Christmas Child, Home Share, Safepark, and more. 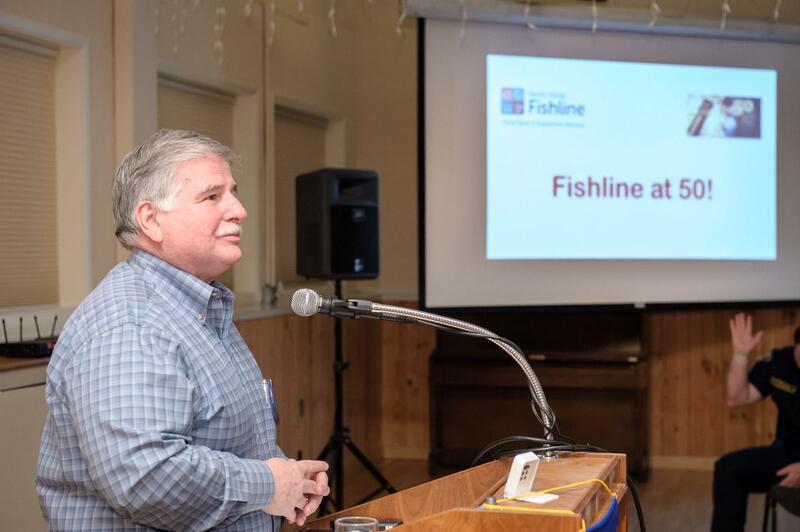 Thank you for sharing the story of Fishline, Tom. We can only hope that we look as healthy and strong as Fishline when we turn 50!